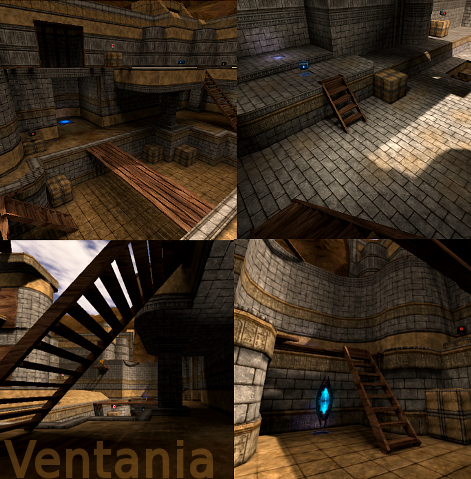 Ventania is a small duel map located in the middle of mountains, is my first attempt at creating a map with this theme (egyptian texture), and i'm satisfied with the end result. The map support FFA, Insta, Effic and any other Duel mode. Added clips outside of map to save performance. Added blendpaint on the lower platforms to simulate sand. Fixed Texture fails, added noclip in some details and changed to "stop speed" the outside Teledest. As rabe reported, now wall textures are on the wall and floor textures are on the floor, not the opposite as before. Seems like a classic Sauerbraten duel map. The map feels good to move around and to play. The layout seems like a safe choice. Some playerstarts (like the 2 in the center of the map near the pile of sand) could have been placed better by putting them more towards the ground. This way, players have more time to dodge the opponent's shots while spawning. This normally isn't an issue, but due the map being so open, it can matter a lot. Although I would rather see some more visuals, there are some details which are pretty fine for such a map. Some more ruined details could have been added for example. The top roof seems flat compared to the first floor. Why is there no sand in the pit with the teleport while there is loads of sand right outside the pit? Despite alle this, the texturing works with the geometry. The clipping works, but could be better. The characteristics of the clipping-material isn't only to keep the player outside a certain area. It is also to let Cube Engine 2 know that a player can't be in that certain space which contains the clipping-material. Due this, you can save a lot of performance for rendering (and a map will be drawn smoother). So try to put the clipping material everywhere outside the map where a player shouldn't belong. In overall, nice map to play and move on, fun fun fun! About the boxes, yep, maybe that texture was made to be a floor/wall, not a box... So i changed them. Solid map. Maybe do not use brick/wall textures on the ground. Looks strange.